The State Duma passes Russia’s response to the Magnistky Act on second reading, but senior officials warn the bill could prove counterproductive. Russian lawmakers on Wednesday voted in favor of a bill to ban child adoptions to the United States, as Moscow considers its response to the U.S.’s Magnitsky Act, which imposes restrictions on Russians allegedly implicated in the 2009 death of lawyer Sergei Magnitsky. The bill, which also proposes to shut down U.S.-financed NGOs in Russia, could prove counter-productive in preventing Russian children finding adoptive parents and harming the work of civil society, some experts warn. The State Duma passed on second reading on Wednesday the so-called “Dima Yakovlev Bill,” Russia’s response to the Magnitsky Act. The majority of the State Duma (400 deputies) voted in favor, with four against and two abstaning. The bill will go on to a third reading on Friday. The Russian bill is named for Dima Yakovlev, a Russian toddler who was adopted by an American family but died in 2008 of a heart attack after his adoptive father, Michael Harris, left him in a car in hot weather for several hours. Harris was later found not guilty by a U.S. court of involuntary manslaughter. The bill has fuelled a strong debate within Russia, with several leading politicians and officials criticizing it as counterproductive. Foreign Minister Sergei Lavrov, Education and Science Minister Dmitry Livanov, Human Rights Commissioner Vladimir Lukin, Minister for Open Government Affairs Mikhail Abyzov and head of the Presidential Human Rights Council Mikhail Fedotov, among others, have expressed concern about the bill. Russia’s president, Vladimir Putin, stopped short of supporting the bill, but said through his spokesman that he “understood” the State Duma’s call for a ban on adoptions to the U.S. Experts at first believed that the Russian bill would hit primarily those Americans who have adopted Russian children and been acquitted of child abuse charges. But Russian lawmakers have gone one step further: not only will they include in the Dima Yakovlev list the names of everybody suspected of violating the rights of Russian children, they also intend to impose a blanket ban on adopting Russian children by American citizens and renounce the Russian-U.S. agreement on adoption. What is more, Russians who also hold a U.S. passport may be forbidden from working for nonprofit organizations, as doing so may result in the activities of the organization being suspended. The same is true for U.S.-financed NGOs that are engaged in political activities. 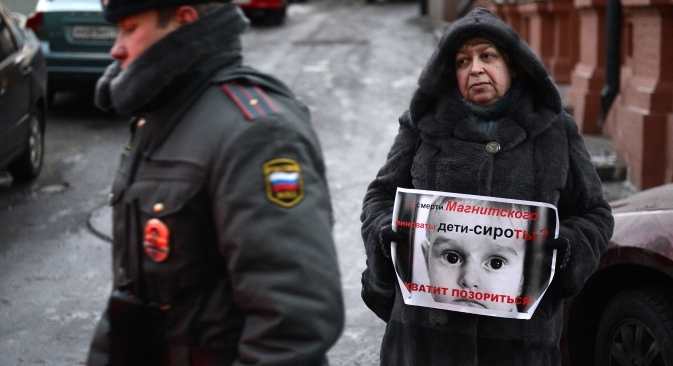 The Duma committee responsible for child adoptions endorsed the amendments on Monday. They are expected to be upheld by a majority in the Duma, although some deputies have said they would categorically refuse to vote for them. But many experts say that, if the amendments are passed, Russians will suffer more than anyone from the ban. Yevgeny Malkin, deputy director of the Electoral Technologies Institute, believes that American couples wishing to adopt will instead turn to countries such as Ukraine. Igor Bunin, president of the Center for Political Technologies, said that U.S. citizens mostly adopt sick children whom Russians do not want to adopt. The law would deprive these children of an opportunity to be part of a new family. Opposition politician Dmitry Gudkov, who is a member of the State Duma’s Constitutional Legislation Committee, points out that, out of the 60,000-plus children adopted by Americans in the last 20 years, there are only 19 confirmed cases of maltreatment, a very small percentage. But Valery Ryazansky, the chairman of the upper house of parliament’s Committee on Social Policy, claimed that the real number of cases of Russian children being maltreated is far higher, and that Russian authorities have not been able to given the opportunity to accurately monitor the welfare of adopted Russian children in the United States. Russia’s Foreign Minister, Sergei Lavrov, told journalists on 18 December that he was against the proposed ban on the adoption of Russian children. He believes that adoption procedures should be improved and more civilized forms introduced, but said that banning adoption altogether was not an option. In spite of widespread criticism, experts believe the law will be passed by the State Duma. After the Duma, it goes to the Federation Council and President Vladimir Putin for approval before becoming law. As for the ban on U.S. financing of NGOs and the participation in their activities of Russians who hold dual Russian-American citizenship, its first targets may be Russia’s two oldest human rights organizations, the Moscow Helsinki Group (founded in 1976) and Memorial (founded in 1987). The veteran founder and head of the Moscow Helsinki Group, Lyudmila Alexeyeva, who holds dual Russian-U.S. citizenship, said she would resist the banning of her organization. “They may withdraw our registration, close our office and freeze our bank account. But in 1976 we had no office, registration or bank account, and yet we managed to operate successfully; now the Moscow Helsinki Group is an organization known all over the world. So we will continue to work, just like we did in Soviet times, and preserve our good reputation while the Duma disgraces itself,” Alexeyeva said. Malkin, of the Electoral Technologies Institute, said that the law could “easily be sidestepped” by NGOs using front organizations. Alexeyeva said that changes could also be introduced into the legislation before it is signed by President Putin, as happened with recent legislation on foreign-financed NGOs. About 30 opposition activists were detained Wednesday during an unsanctioned picket against the Dima Yakovlev bill outside the State Duma in downtown Moscow.